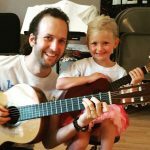 Guitar Lessons for Children and Adults from a Dedicated and Professional Teacher. Start the journey: Contact me today! Improve their academic, social, and emotional skills. Are backed by 80+ years of teaching expertise. Are FUN for your child! If you’re interested in learning guitar, we highly recommend Kale! …we loved it and made the commitment, and haven’t regretted it for a second. I believe the most important thing is having a connection with a great teacher… Kale has an amazing ability to connect with students of any age, and it has been amazing for us to see our young son develop a respect for his teacher and an enjoyment of making progress through practice. His relationship with Kale is… a rich enhancement of his overall view of the world and himself. My favorite thing about our lessons is to see Kale meet our son where he is at each time and then find a way to learn more about himself at the same time as learning more about music — quite a feat given that it can be hard to get a four-year-old to do much of anything if they’re not in the right mood. 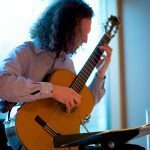 After studying classical guitar throughout college I was concerned about finding a local instructor with a solid classical background, who could teach well beyond the basics. With Kale, I was able to jump in comfortably where I had left off. He has an outstanding knowledge of the instrument, theory, and the genre, surpassed only by his knack for teaching it. He truly understands the nuances and techniques of great playing, and is able to hone in on areas of improvement that I wouldn't pick up on otherwise. He takes the time to find music and exercises that are enjoyable and challenging - at the appropriate level for each student. On top of all this, Kale is relatable, patient, encouraging, and a blast to work with; I look forward to his lessons each week. He couldn't come with a higher recommendation! For sure. Kale knows his stuff. I've know Kale for over ten years and I've always appreciated his interest in deeply exploring many different guitar methods and teaching skills. I know that he brings a depth of knowledge and experience to his students, and doesn't get complacent, but is always learning and adapting his approach to fit a given student's needs. As a fellow music teacher, this is inspiring to see. Kale is good natured and has a great sense of humor... studying with him would never feel too "heavy" or too much like another thing you "have to do". He has also worked extensively with different age groups and knows a wide range of material. I think any student should feel confident that they have a qualified teacher.